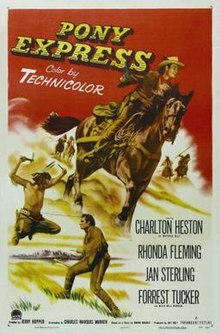 Pony Express is a 1953 American western film directed by Jerry Hopper and starring Charlton Heston as Buffalo Bill, Forrest Tucker as Wild Bill Hickok, Jan Sterling as a Calamity Jane type character and Rhonda Fleming that was filmed in Kanab, Utah. The story is largely based on the 1925 silent film The Pony Express and tells a highly fictionalized account (e.g. Buffalo Bill was born in 1846 and would have been 14 at the time) of the formation of the Pony Express rapid transcontinental mail delivery pioneers in 1860’s United States. In 1860 Buffalo Bill and Wild Bill Hickok join forces to establish a mail route from St. Joseph, Missouri, to Sacramento, California. On the way they battle the weather, hostile Indians and California secessionists intent on shutting the operation down to encourage California to secede from the Union. Charlton Heston did a film tie-in advertisement for Camel cigarettes. Parts of the film were shot in Kanab Creek, Kanab movie fort, the Gap, and Johnson Canyon in Utah. ^ "Western movies filmed in Kanab". Deseret News. 2001-10-25. Retrieved 2013-12-01. ^ Popular Science - Google Books. Books.google.com.au. Retrieved 2013-12-01. This page was last edited on 13 February 2018, at 21:17 (UTC).